Here you can learn how to master your Relio² devices and unleash their full potential, by reading our step-by-step, fully illustrated guide. 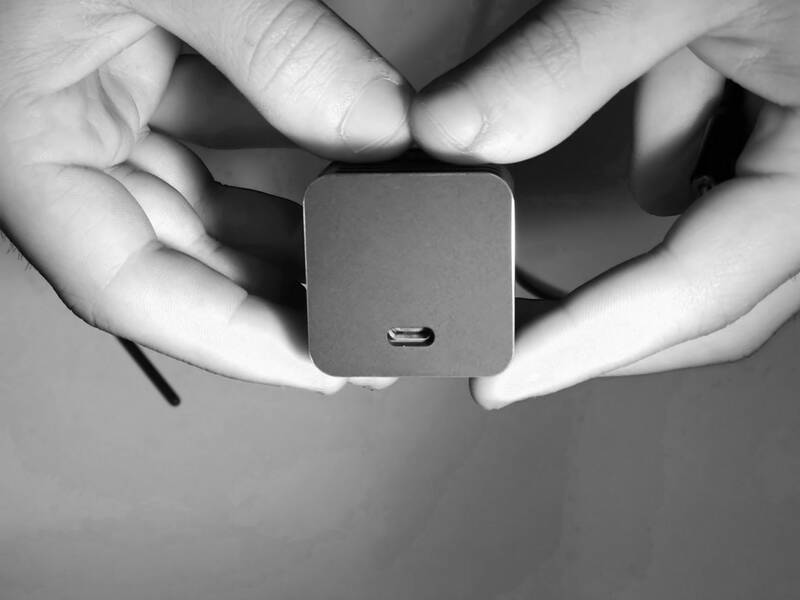 Relio² is a high performance, ultra-high CRI LED light powered via USB. It is conceived to be used as a portable or static illuminator, for domestic and professional use. Do not stare into the high-power beam, nor power-up the device without any lens installed. Do not activate the “Strobo Mode” if you are sensible to high-frequency light flashes. Do not use with wet hands or in damp environments. If operating conditions are not met, or you notice an unattended behaviour, stop using the light. Not suitable for use by children, as it contains small parts. Relio² should be serviced by professionals only. For further information, consult our sales terms. 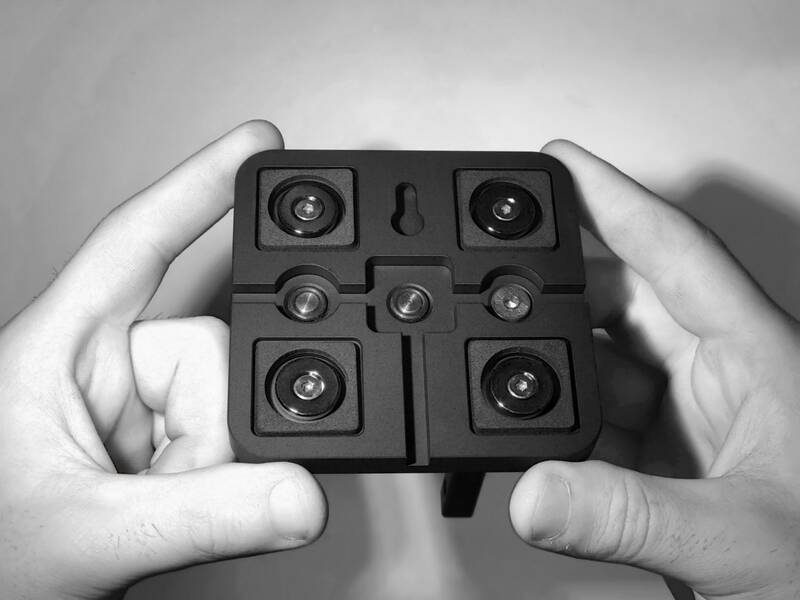 Relio² is equipped with a standard photographic UNC 1/4-20 socket. 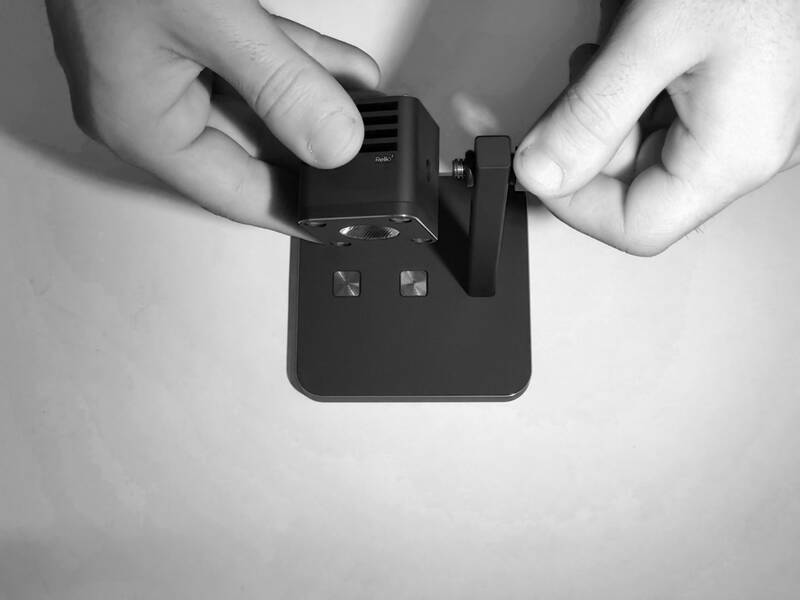 Just use your hand to mount, unmount and rotate the light module on its stand. 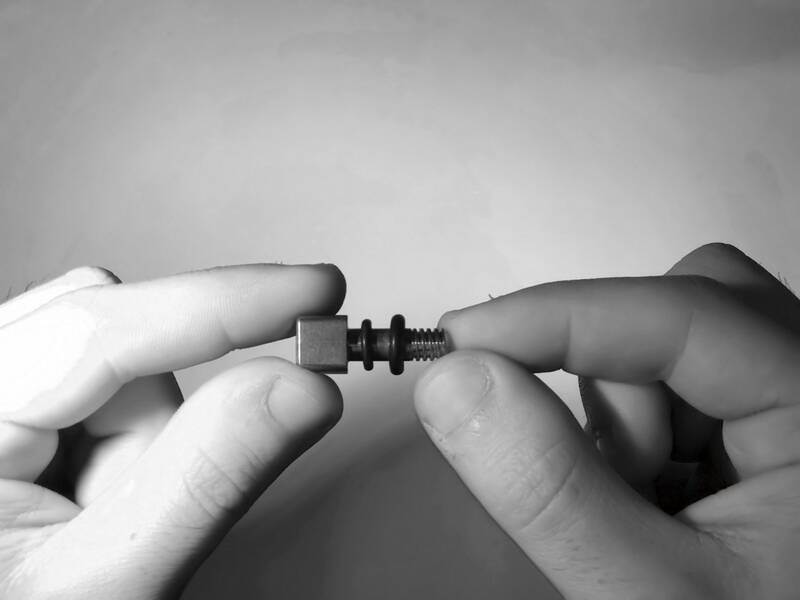 Do not overtighten the bolt, it's not necessary. The mounting bolt is equipped with two differently-sized o-rings. Place the smaller one is on bolt’s handle side, and the bigger one between the main rod and the light module. Spare o-rings are included into the package. 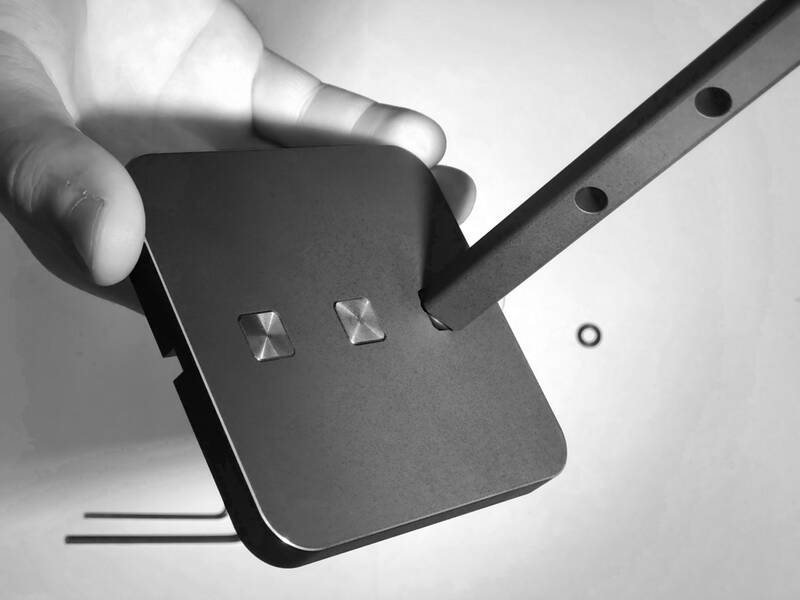 The Base plate is what allows Relio² to be mounted on desks, shelves, walls, ceilings and magnetic surfaces. If your target surface is non-ferrous, you can use the four included metal washers to make it magnetic. 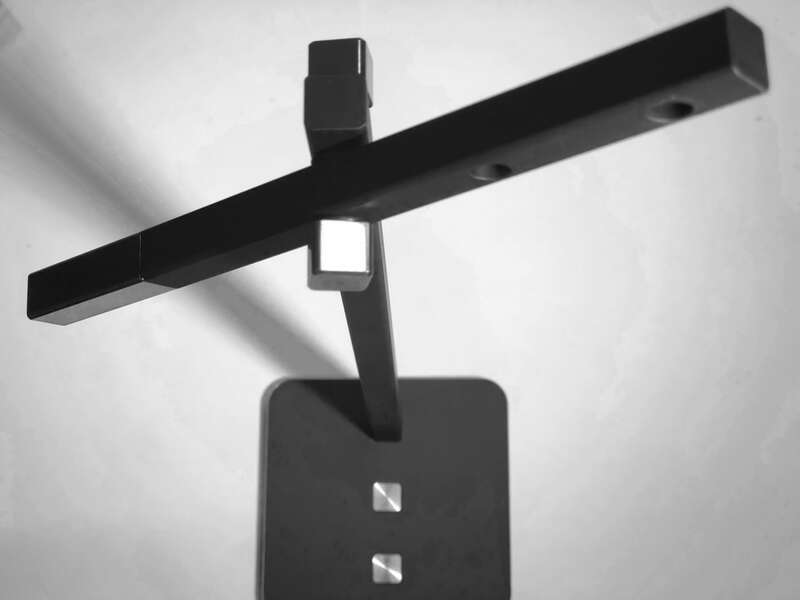 Use the slotted notch only for temporary installations, as it s not as stable as a fixed, magnetic attachment. To free-up all the three slots on the Base plate, you have to uninstall the stainless-steel caps that cover them. They’re secured with an o-ring. Just push from the bottom to expel. Be careful not to lose the o-ring. Grab the freed-up cap from the top. Again, be careful not to lose the o-ring. To reinstall, just follow the steps in reverse. Neodymium magnets installed on the Base plate are very powerful. If you do not want them close to your professional equipment (mechanical hard-disks, reflex cameras, credit cards, etc.) you can remove them by using the hex key included into the package. Warning! Neodymium magnets are very brittle. Be careful when removing them. Do it one at a time, and keep them very far away from eachother. If they crash together, they will break. To swap the main square rod to a smaller or longer one, use the hex key included into the package. Tighten securely, otherwise the rod will become loose. Be also careful not to scratch the Base plate surface while performing a rod swap. If desired, use a soft cloth to shield the surface while detaching the rod. 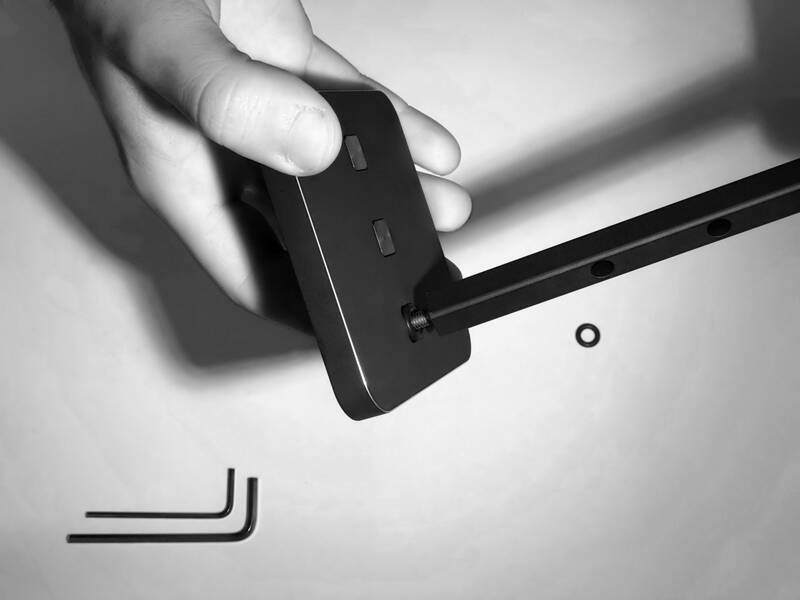 To add a second degree of rotational freedom, you can install a big o-ring between the Base plate and the rod. The additional o-ring is included into the package. After placing the o-ring inside the Base slot, start to screw the rod by hand while holding the rod screw with your finger. Tighten the rod by hand, stopping when you notice that the o-ring is starting to compress and oppose the rod rotation. 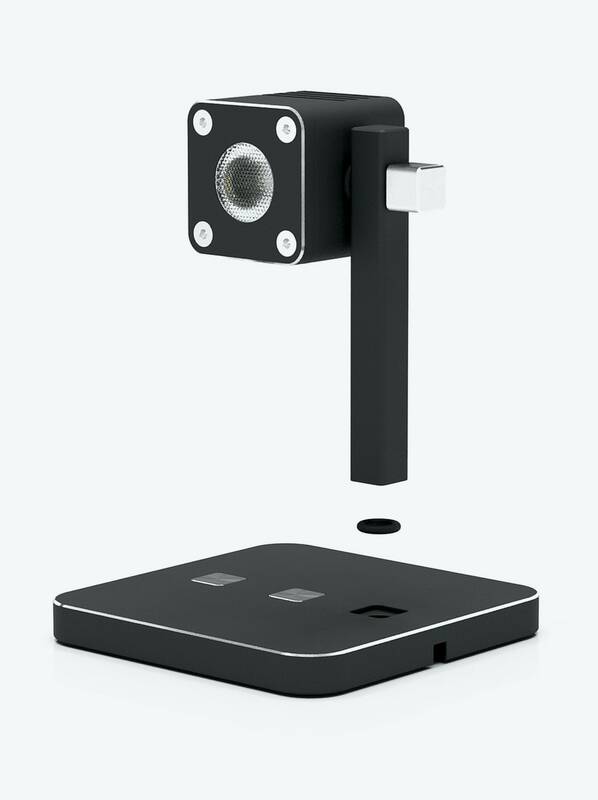 With the o-ring installed, you’ll be able to swivel the rod by ±45º. 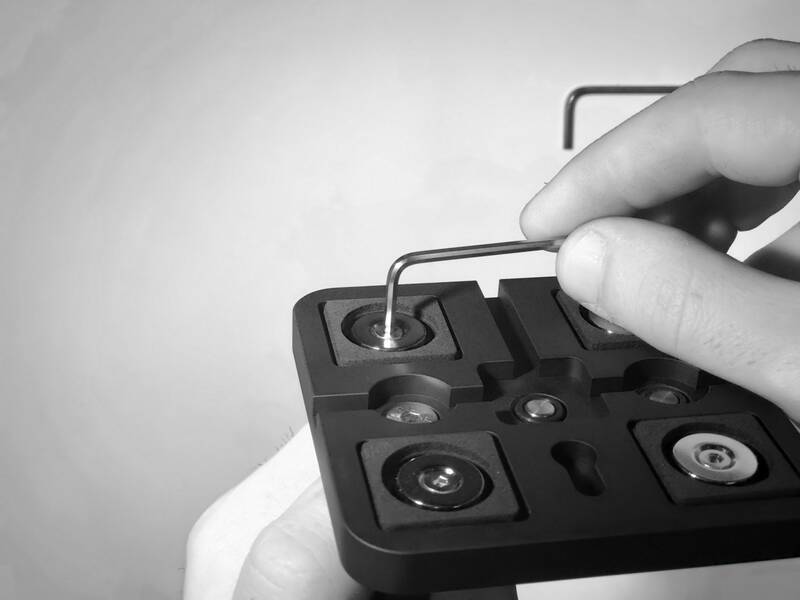 To prepare your Desk kit for intallation, you have to start by installing the heavy stainless-steel counterweight on the medium-sized rod (the one with 3 holes) included in your Base kit. Start by locating the very small o-ring included into your Desk kit package. 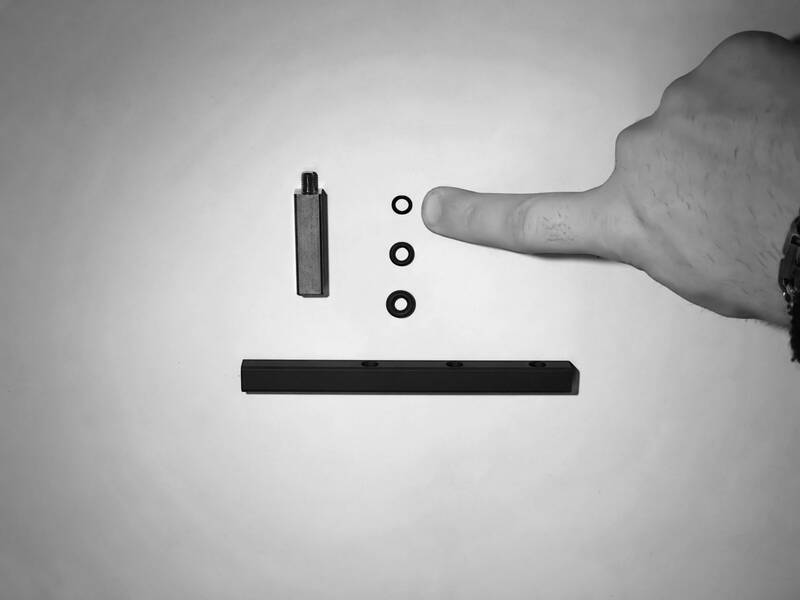 Place this small o-ring around the counterweight’s thread, while keeping the assembly in a vertical position not to lose the o-ring. With the small o-ring in place, screw the counterweight into the medium rod. Now take the main nut-and-bolt stainless-steel hinge that comes with your Desk kit package. Install the long rod onto the Base plate, by firmly tightening the rod’s screw. Assemble the two rods as shown in the picture, by taking care of placing all the three o-rings as shown in the picture. Now tighten the nut-and-bolt hinge by hand. 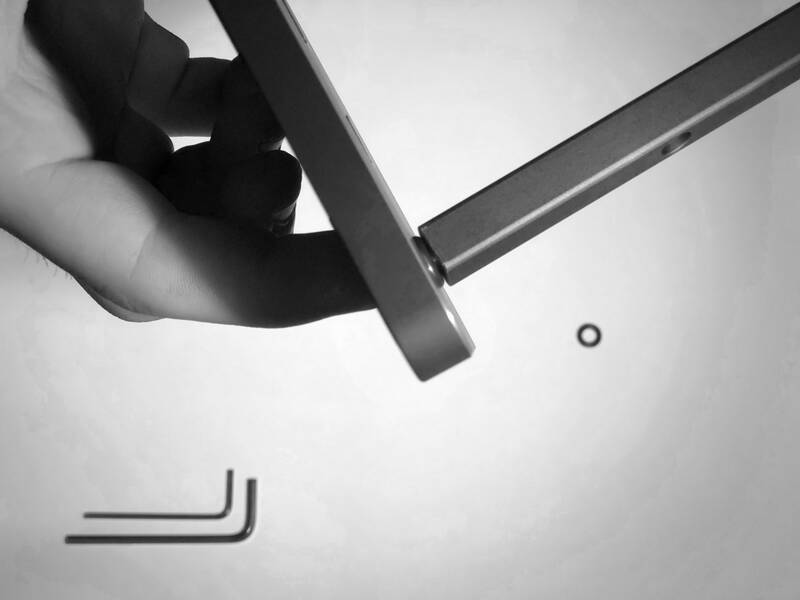 Do not overtighten the hinge, as you’ll generate unnecessary strain on the o-rings. Tighten as much as it’s needed to keep the rods firmly in place. 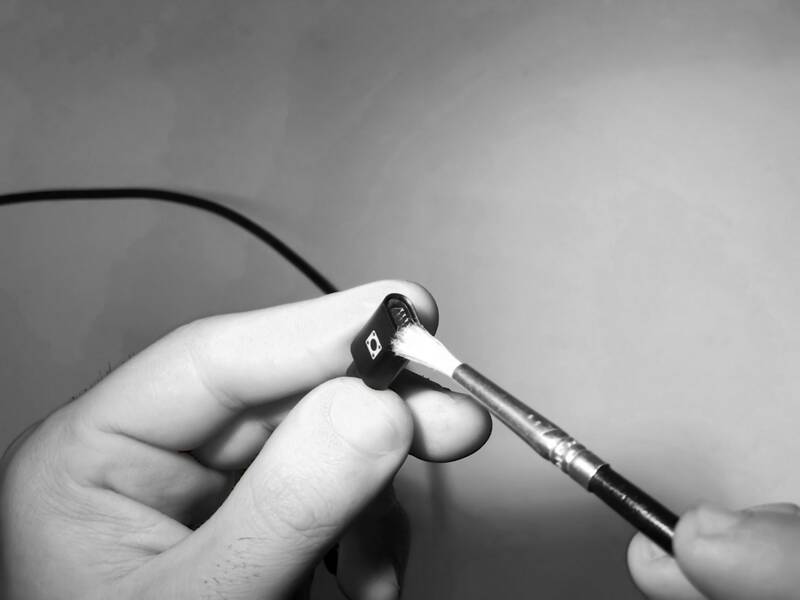 To disconnect the magnetic cable, bend it by 45º and pull it away. If you pull in a straight line instead, you’ll probably pull out the magnetic bit too. The magnetic cable and magnetic end bit are, indeed, magnetic. If you work in dirty environment, the magnetic cable assembly may collect dust and become non-functional. Clean both ends with a dry brush to remove any trace of dust. If not enough, use compressed air (at moderate pressure). Do not clean the magnetic bit with water, solvents or chemicals. 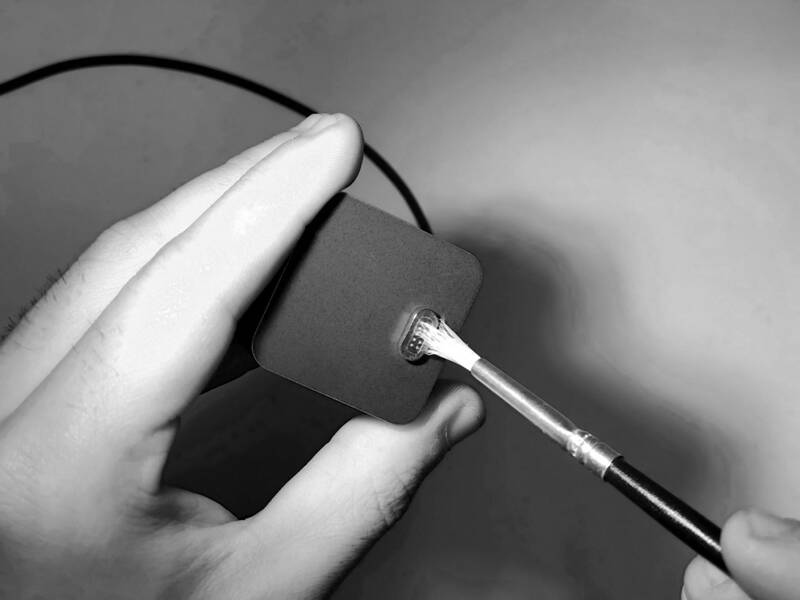 Do not use the magnetic cable if you intend to use Relio² in dirty environments. Opt for a classic, fixed USB cable instead. A beautiful 3m nylon-braided fixed USB cable is included into the Base kit package. If you want to use a fixed USB cable, you have to remove the magnetic bit first. 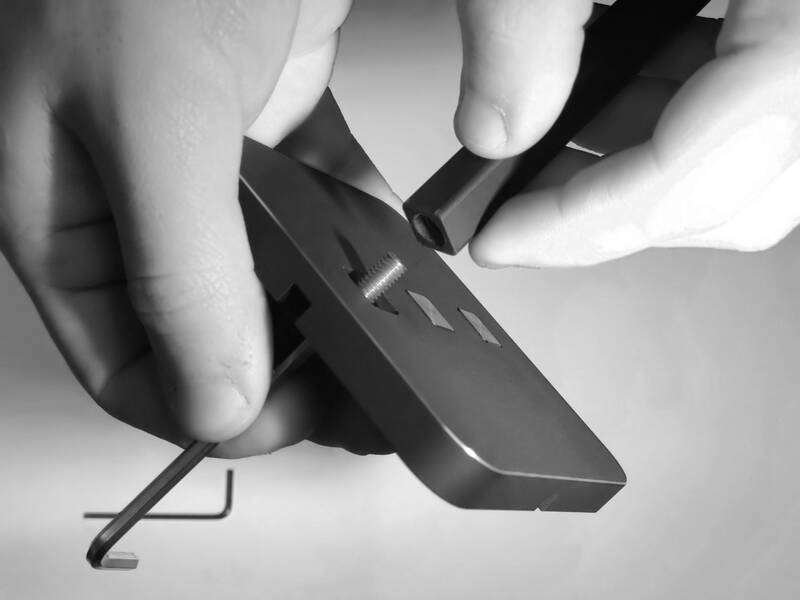 With the magnetic cable assembly in place, start to wiggle the plug left and right. The magnetic bit should become loose, so that you can pull it away. 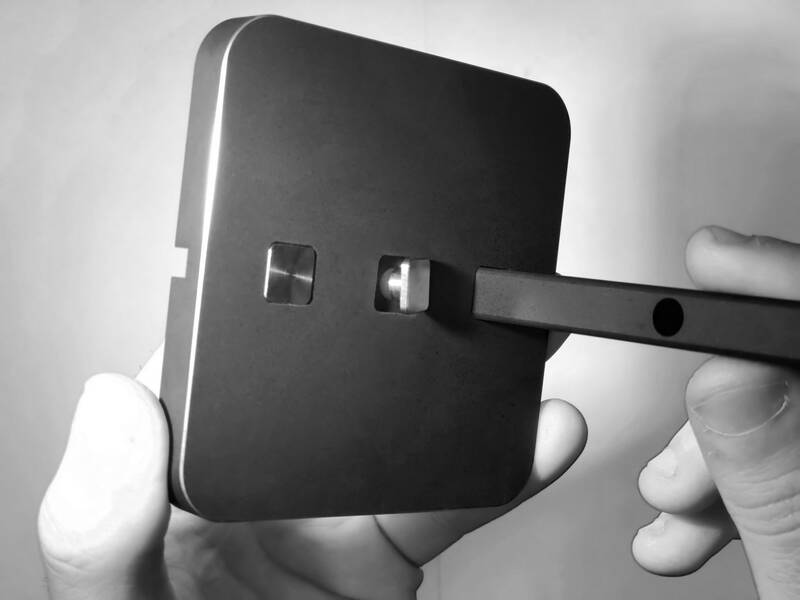 When the magnetic bit is removed, a standard microUSB socket is ready to host and standard USB plug. Use only high-current USB cables, otherwise Relio² may malfunction or become less bright because it’s not getting enough power. To swap the the lenses, unscrew the light module cap with the included hex key. Do not overtighten the cap screws, as it’s unnecessary. Do not touch the clear side of the lens, you may scratch it. Place the new lens carefully in its slot, and align the cap so that you don't need any force to close it. If you notice that the cap does not align properly, do not force the assembly! Remove the cap and re-align the lens. If you force the assembly, you may damage the lens or the LED component. It’s easy! Each lens has a specific upper pattern. This animation shows you how to distinguish them. 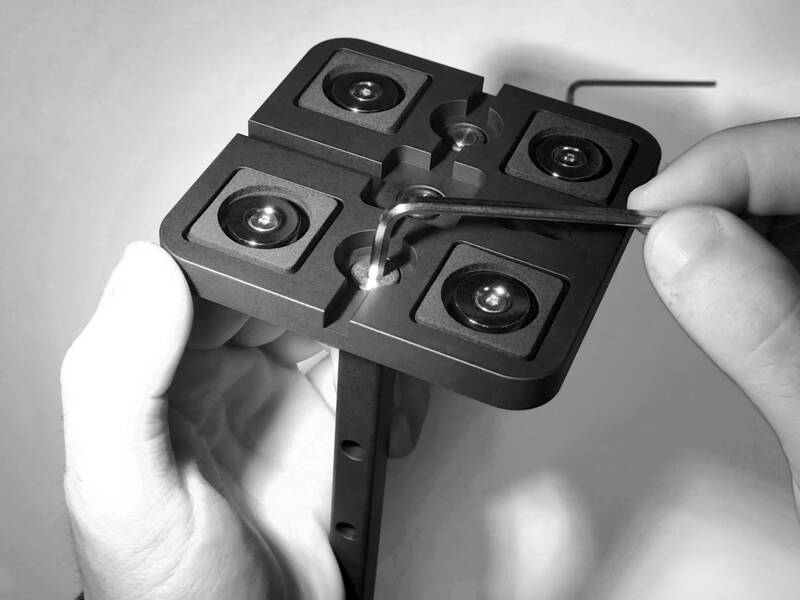 The 90º lens is included into the #DESK kit only. 60º and 90º lenses are very similar if you look at their top. To distinguish them, look at their bottom: 60º is thinner, 90º is noticeably larger. You can ask for additional details and specifications by contacting us.